On July 3, 2013, Fu Ping was interviewed by Qiaobao, a Chinese language newspaper published in the USA, in which she answered some questions raised by her alma mater Suzhou University. The interview is originally in Chinese. Qiaobao: Suzhou University accused you for falsifying academic credentials. They displayed your student registration and files at the school and proved that you had dropped out in March, 1982 and did not earn any degree there. Have you ever publicly stated that you have a Bachelor degree in Chinese Language and Literature from Suzhou University? 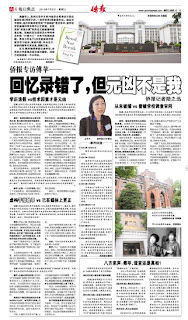 Fu Ping: I rarely mentioned Suzhou University because I didn't obtain any degree there. In my social media platforms, such as LinkedIn, Facebook, Twitter, etc., I never included Suzhou University. In fact, in all places I have control, I never mention Suzhou University. But there are places that I have no control of. About 10 years ago, our company's marketing department has a girl from Malaysia. I told her that I did not graduate from Suzhou University. So she wrote on our page "post graduate degree." Because she thought "post graduate degree" could also mean "non degree" besides "masters graduate student." We made corrections right away and it was not on our company web site. But recently when our company changed web site, an program that was automatically fetching files made it visible again. I did not discover it in time. Right now there are many web sites, including Bloomberg, Wall Street Journal, etc., all carried this incorrect information. I found out later that it was because their automated search feature. The real culprit of this academic credentials fraud is the automated search, not me. In fact, my business is in computers. I earned BS and MS in computer science in the US. I do not need a degree from Suzhou University for any of my work. It's not like a degree from Harvard, after all. Another place is a technological paper I wrote as the third author. The author's bio section of this paper stated that I earned a Bachelor of Chinese Language and Literature in 1983. As a matter of fact, I did not write that. I only published a technological paper. The author's bio was added by editors. Qiaobao: In your book, you said that in the fall of 1982, you "innocently walked across campus making preparations for graduation, someone sneaked up behind me, jammed a black canvas bag over my head ... escorted into a nearby car." Since you had already dropped out school that March, why were you walking on campus in the fall? Fu: This is a typo. If you read the whole passage, all the stories happened in the spring. The fall only occurred in this sentence. It was an error. In fact, I have corrected it as soon as I found this mistake. Qiaobao: You also mentioned in your memoir that you published a paper while you were in school, on the subject of female infanticide under the one-child policy. You were arrested and deported because of it. But Suzhou University said that all the graduation thesis in the Department of Chinese Literature were about literature or linguistics. They wouldn't be involved in sociology subjects such as infanticide. There were no teacher for this thesis of yours. How do you respond? Fu: Before graduation, I wanted to go to graduate school in journalism at Nanjing University. So I intended my thesis to be like a news report. In 1981, the one-child policy was going crazy in China and got my interest. With the permission from my adviser, I started interviewing people and then discovered the female infanticide problem in rural China. I heard a lot of stories from rural women and became their sounding board. In order to do this work, I had indeed spent a lot of time and missed a lot of classes. Then I wrote them down and showed my teacher. My teacher passed my article to his friend in Shanghai's Wenhui Daily. At that time I did not know where this paper reached, but heard later that it was handed higher and higher in the official hierarchy and reached the Party Central. This was not good news for the new leadership. Therefore I was arrested and locked up for 3 days. After the release, the police told me to leave Suzhou University and not tell anyone the reason. That's why my mother and I were insistent in dropping out of the school. Qiaobao: Who is the teacher who allowed you to write this article? Fu: It's not just one, but I cannot provide names. In fact, the person who approved my work no longer admits that. I don't think it's necessary to expose this. They are all my teachers and classmates. If they want to say I am lying, then let them say that. I know who I am and don't want to explain. Qiaobao: In your book you said that you experienced "finger checking" for pregnancy. This was strongly condemned by Suzhou University and your classmates. What happened there? Fu: This is indeed my mistake. I wrote about "finger checking" to illustrate the difference between China's one-child policy and the population policy in the west. In 1981, getting pregnant in China could be illegal. Therefore there was checking with fingers. But the procedure was using one's own fingers to prove period, not allowing other people's fingers to enter. I told my coauthor Meimei Fox of this concept. But she did not write accurately. The illegal pregnancy checking was subjecting to those who have already given birth, not all females. It was written in the book as for all women, but not students of Suzhou University. But Chinese are not a precise language. It could be interpreted in different ways when viewed from different angles. It read like all female students in Suzhou University must submit to the checking. I discovered it later and corrected it on New York Times. I feel sorry for this. I did not spot this mistake before the book went to press. Later Fang Zhouzi hyped on it and wrote it in a very dirty way. If this hurt the dignity of students in Suzhou University, I am willing to apologize. But the "finger checking" absolutely happened. It was not just me. Other articles have mentioned it too. I wrote it because I hope to raise the outside world's awareness of China's one-child policy. It was not meant to insult female students in Suzhou University. Qiaobao: You had participated in a literature organization called Red Maple Society. You said in the book that you were arrested and interrogated because an article published by the society. Suzhou University said that was a lie. What do you think? Fu: I had indeed not been taken into custody because of Red Maple Society. But in my book I used the word "arrest," which could mean "taking into custody" or "detain," it could also be understood as "stop." It was not as going into prison, but that they don't allow you to attend classes. They put several of you into a room, make you write confessions and expose each other. The Department of Chinese Literature had a student journal called Wu Gou. According to my memory, I was the editor-in-chief (主编) for Wu Gou, but not the ultimate decision maker (总编). Because I was the only girl in the society and the journal, they let me be the editor-in-chief, in charge of printing and logistics. Now some people say I wasn't the editor-in-chief. If they could tell me who was, I would like to correct that. In January, 1979, Wu Gou published the article "The Confession of a Communist Party Member" by Liu Buchun. The article raised doubts on Communist Party and Communism. At that same time, Peking University, Tsinghua University and other 11 colleges co-founded the magazine This Generation. They reprinted an article from Wu Gou. Our journal sent a representative to Beijing to attend a meeting by This Generation. I don't remember who went, but it wasn't me. After arriving at Beijing, he didn't attend the meeting but went to the Great Hall of People to watch Deng Xiaoping receiving leaders of the Communist Youth League. There, Deng Xiaoping clearly stated that he wouldn't allow universities publish their underground journals. Afterwords, This Generation and Wu Gou all closed down. The school investigated and interrogated us. The Red Maple Society could not meet any more. If Ping Fu really wants to correct her educational background, it is very easy for Ping Fu to update her Bloomberg/BusinessWeek executive profile. Ping Fu can click on “REPORT DATA ISSUE”, and indicate that she does not have a Ph.D. degree from Nanjing University. She should also indicate that she does not have a Master’s degree from Suzhou University. She is busted by her another Alma Mater, UIUC, this time! Very funny to see her unwise defense. Every US university that Ping has attended could have a record with her fake degree. Which one will be the first to nail her down?